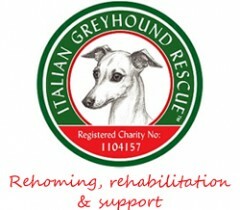 The Italian Greyhound Rescue Charity has partnered with the Animal Health Trust (AHT) to conduct clinical research into Inherited Epilepsy in Italian Greyhounds and we need your help to tackle this very serious genetic illness. Inherited Epilepsy, or Idiopathic Epilepsy, is caused by an abnormality in the brain that leads to repeated seizures. It usually develops in affected Italian Greyhounds between the ages of 3½ – 6 years old and is extremely distressing for both the affected Italian Greyhounds and their owners. More information about epilepsy and seizures is available in the Epilepsy: Information for Dog Owners Factsheet (PDF). The AHT research is aimed at identifying the genes responsible for Inherited Epilepsy, and it’s critical that the AHT build-up a DNA database of Italian Greyhounds in the UK. DNA samples from pure-bred Italian Greyhounds affected by seizures ( a copy of the pedigree needs to be submitted) are needed. More DNA samples are needed from Italian Greyhounds affected by seizure. You can help by taking a saliva swab from the cheek of your Italian Greyhound, a simple and painless process that takes less than a minute, and sending it in for inclusion in the research programme. The research requires DNA samples from pure-bred, pedigree Italian Greyhounds that are affected by seizures. All research is carried out in the strictest confidence and the AHT does not share genetic information about any dog with anybody except that dog’s owner. The only cost at the moment is a first class stamp, unlike other DNA tests that can cost anything from £24-£70.00. Once the research into inherited epilepsy is complete, and a DNA test has been developed, the AHT will happily provide the results of any dogs that were used in the research, free of charge, to that dog’s owners upon request. So it is in your and your dogs’ best interests to take part now.